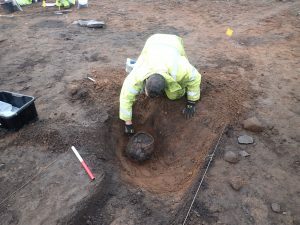 In March 2018, the final programme of post-excavation analyses of the archaeological remains at Carnoustie got underway with the wet-sieving of the soil samples taken during the excavation. This is the process by which we recover tiny minute environmental evidence (such as charred cereal grains) which might reveal the diet of the people who inhabited the site at Carnoustie during the Neolithic and Bronze Age. What period or periods are represented by the artefacts and features? Can datable features reveal further patterns in distribution of activity across the site? Does the artefactual assemblage reflect a typical assemblage, reflective of the periods in question and is contemporary local/regional/national trade represented in the assemblages? archaeological features, temporally and spatially? How has the local environment changed over the sequence represented by the deposits sampled? What changes over time can be directly related to human intervention and/or natural processes? Is the environmental record reflective of sustained cultivation in this locale during the Neolithic/Bronze Age period? or is there evidence of other land use here? This entry was posted in Blog on March 30, 2018 by Author. 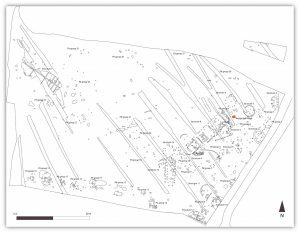 In January 2018, the specialist post-excavation analyses of the Carnoustie hoard was collated into a report by Alison Sheridan. This revealed that the sword had been wrapped in a woolen blanket or cloak when it was buried. The leaf-shaped bronze sword is classed as a Ewart Park type. Radiocarbon dates for Ewart Park phase metalwork in Scotland are sparse; the Carnoustie date of around 1000 BC is valuable new knowledge, which extends this phase of metalwork backwards in time than the 900–800 BC date bracket usually attributed for Ewart Park metalwork. The spearhead had been wrapped in sheepskin when it was buried with the sword. The leaf-shaped bronze spearhead is of Type 11A in the latest typology of British Late Bronze Age spearheads and is among the longest examples of its type. There were no traces of wood (from a shaft) in its socket. 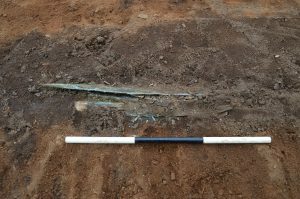 Compositional analysis of the bronze of the spearhead, undertaken by Peter Northover, revealed that it comprises 86.7% copper, 11.4% tin and 0.68% lead, with trace amounts of several other elements. Lead isotope analysis by Jane Evans and Vanessa Pashley of the Natural Environment Research Council revealed that the lead probably originated in a central English ore field. Compositional analysis of the gold by Lore Troalen from National Museums Scotland revealed the gold to be of high purity, and lead isotope analysis of the gold showed that it grouped with southern Irish and southern British ore compositions. 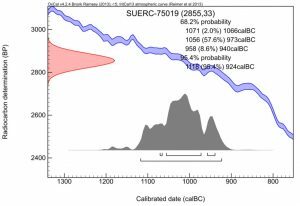 An origin of the lead content in an English ore field seems likely. The Carnoustie spearhead is one of only five examples of spearheads adorned with gold binding in Britain and Ireland, the others being from Pyotdykes near Dundee, Harrogate in Yorkshire, Lough Gur in County Limerick in south-west Ireland and another from Ireland. A complete but fragmented bronze sunflower-headed, swan’s neck bronze pin was found lying over the pommel, hilt and upper blade area of the sword, its head at the pommel end. 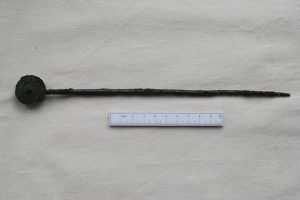 Fragments of woven textile were associated with this pin, including in the narrow area between the shank and the back of the pinhead – thereby indicating that the pin had been used to securing the woolen cloth wrapped around the sword. Compositional analysis using X-ray fluorescence revealed that the pin, like the sword and the spearhead, is of leaded bronze. 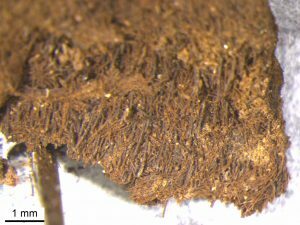 The fragments of textile were examined by Susanna Harris of the University of Glasgow using scanning electron microscopy, who concluded that all were of sheep’s wool, and that at least two different textiles were represented. One, found around the socket of the spearhead is a fine, tabby weave, woven using z-spun thread with one thread system finer that the other. The other, found associated with the pin and the annular mount that decorated the scabbard, is a slightly coarser fabric, woven with z-spun yarns with thread systems of similar diameter. There is no sign of any dye in either fabric. The fact that a very similar deposit was found at Pyotdykes, just 20 km to the west of Carnoustie is remarkable. Along with numerous other finds of Late Bronze Age metalwork in Tayside and Fife, this attests to the wealth of the Late Bronze Age elite in this part of Scotland. The Pyotdykes deposit comprised two swords (with traces of a composite wood and animal skin scabbard associated with one) and a gold-bound spearhead. This entry was posted in Blog on January 20, 2018 by Author. It is important to realise that archaeological excavations are not an end in themselves. Excavations are really just the gathering of archaeological evidence. This evidence needs to be analysed to make sense of what the archaeological remains mean. 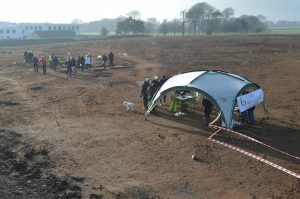 So the archaeological fieldwork – such as the evaluation which first discovered that there was archaeology here at Carnoustie, the monitored stripping of topsoil which revealed the extent of archaeology and the excavation which recorded the archaeological remains and recovered the archaeological arefacts – this is just the beginning of a long process of investigation. Therefore the first thing archaeologists do once they have completed an excavation, is to prepare an interim report. This is called a Data Structure Report and provides the initial results of the fieldwork. The main purpose of this report is to provide a record of the archaeological features that have been excavated, showing where these features are and offering preliminary interpretation. 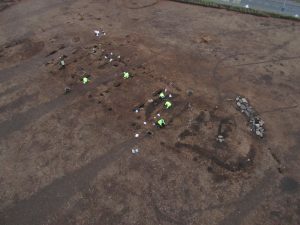 The Carnoustie excavation interim report, which was completed in June 2017, is important for the subsequent specialist analyses of the finds because it shows exactly where each artefact was found and allows us to gradually build up a picture of how and when the various archaeological features were created and abandoned. This entry was posted in Blog on June 30, 2017 by Author. On 17 February 2017, the GUARD Archaeology team completed their excavation of the archaeological remains at Balmachie Road, Carnoustie. Altogether they had recorded the remains of up to 12 sub-circular houses that probably date to the Bronze Age along with the remains of two rectilinear halls that likely date to the Neolithic period. The Neolithic features are significant in themselves, and include the largest Neolithic Hall ever found in Scotland. The hoard was buried in a pit close to a roundhouse that cut through the large Neolithic hall. 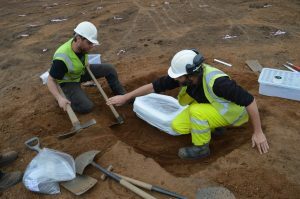 Over the previous six months, the Carnoustie excavation had received a lot of interest. Not least from teachers and pupils at Carnoustie High School, which lies adjacent to the site. So GUARD Archaeologists had led guided tours of the excavation to 200 pupils and teachers from Carnoustie High School and other schools in Angus. Following requests from Angus Council, GUARD Archaeology were also able to offer week-long work placements to two pupils from Carnoustie High School and Brechin High School Community, who are interested in studying archaeology at University. 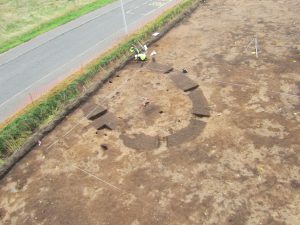 The Carnoustie excavation ended with Open Days and guided tours of the site over the last two days of the excavation in February 2017 attended by over 200 people. This entry was posted in Blog on February 17, 2017 by Author. Normally post-excavation analyses of artefacts recovered from excavations only begins once the entire excavation has been completed. 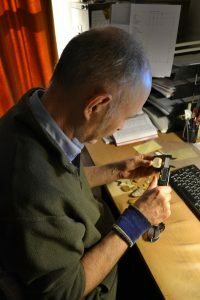 But in the case of the Carnoustie hoard, specialist analyses was required as soon as possible. This was because the organic remains within the hoard were so delicate and fragile that there was a danger that they would degrade within a very short time. They urgently needed conservation but before this could take place, specialists required to examine the remains and take appropriate samples for scientific testing (such as radiocarbon dating, isotope analyses, X-ray Fluorescence analyses) to extract crucial information about the artefacts. So post-excavation analyses of the hoard begins in January 2017 with a Post-Excavation Research Design that lays out the key questions we want answers to and which identifies the various types of specialist analysis appropriate to each type of archaeological material that might answer these questions. This entry was posted in Blog on January 7, 2017 by Author. As the machine excavation of topsoil continued to reveal archaeological features so the archaeological excavation area continued to expand until by December 2016, the GUARD Archaeology team of nine archaeologists had discovered around 1000 archaeological features spread over a 17,700 sqm area. These features comprise numerous pits, post-holes and ditches. Many of these features are clustered together in patterns that can be recognised as house structures of various shapes, from elliptical, round and rectangular. From the various artefacts (pot sherds and flints mainly) that are beginning to be recovered, these houses appear to be prehistoric. This entry was posted in Blog on December 15, 2016 by Author. On Monday 12th September 2016, the soil block was delivered to our Finds Lab where it could be assessed by specialist Finds Conservator Will Murray of the Scottish Conservation Studio. The plan was see how it could be carefully excavated and the artefacts conserved. The soil block was then CT-scanned and x-rayed by the School of Veterinary Medicine at the University of Glasgow, with assistance from Gawain Hammond, Head of the Diagnostic Imaging Unit, and his team. The scan and x-ray provided valuable information and imagery to assist in the recovery of the items from the soil block. 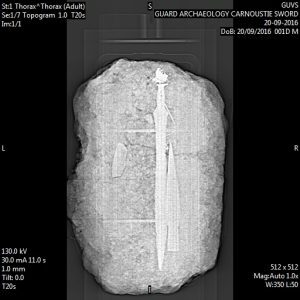 The x-ray shows that the bladed artefact is a sword and the gold decorated object is a large spearhead. But the x-ray also shows a pin lying across the handle of the sword. 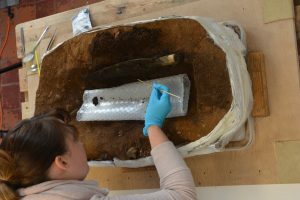 The subsequent excavation of the soil block was undertaken over two weeks in November 2016 at GUARD Archaeology’s Finds Lab by GUARD Archaeologist Beth Spence, with Will Murray on hand to advise on the conservation of the artefacts. This excavation is one of the few times such a Bronze Age hoard has been undertaken in laboratory conditions. This is enabling every tiny scrap of artefact to be carefully recovered and recorded. 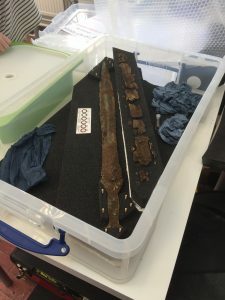 The excavation has recovered, along with the sword and spearhead, a bronze pin and scabbard fittings (a chape to protect the tip of the scabbard and a ring that may have connected the scabbard to a belt. More than this, the excavation is revealing (and more importantly recovering) extremely fragile organic remains (including what looks like fur-skin and textile fragments) adhering to the bronze and gold artefacts. Finding such organic remains is EXTREMELY unusual, especially in a dry site like the one at Carnoustie (ancient organic remains often only survive in wetland, submerged or very dry conditions). The organic remains also include the sword’s wooden scabbard itself, which is very rare. 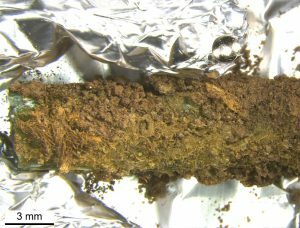 In fact this is so rare a find, that the Carnoustie example is probably the best preserved Bronze Age wooden scabbard ever found in Britain. This entry was posted in Blog on September 30, 2016 by Author. On Friday 9th September 2016, the GUARD Archaeologist monitoring the machine excavation of topsoil noticed something green just underneath the topsoil. Green is a sign of something with copper in it (like bronze) as this is the colour that oxidised copper turns. However, there was also a glint of gold, which is much more unusual (one of the reasons that gold is highly valued is that it doesn’t change colour like bronze or iron). 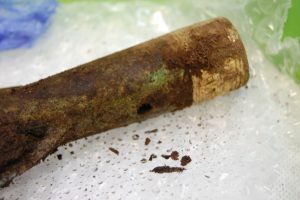 While the green artefact appears to be a blade, the gold is decorated and appears to be part of a socket of another bronze artefact. Owing to the fragile nature of these remains and that the site was going to be left open for the weekend, our team removed the entire pit (and the surrounding subsoil which it was cut into) as a single 80 kg block of soil. This was then delivered to our Edinburgh Office that same day, where it could be safely stored over the weekend. This entry was posted in Blog on September 15, 2016 by Author.